The Perms provide more of their peppy alt-rock on Miracle, their seventh release. One thing that remains consistent for the band is their catchy writing, polished instrumentation, and retro rock vibe. While the band has a distinct sound, each of their songs has its own identity. Some sound inspired by fifties rockers, some have a folksy feel, and others fit in with modern alt-rock. 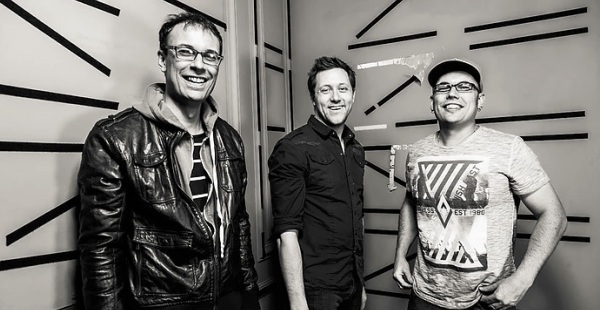 This time around, many of the tracks have hopeful, motivational lyrics such as “Now November” where they sing “Life is short…it’s up to me and you.” On “Think Less” the trio (Shane Smith on bass and vocals, Chad Smith on guitar and vocals, and John Huver on drums) shows off their broodier side with more bassline and less synth. “Busy Izzy” has similarly deep vocals while at the same time sounding inspired by ’50s classic rock. The retro-inspired sound is one of the band’s strengths. “Lose Yourself,” the album’s first single, stands out as the catchiest, most radio-ready track and contains a universal message of embracing your identity and not being self-conscious. It would be nice to hear this track receive some airplay. The album ends with “Gone,” a wistful acoustic-laden track that finishes this collection of short and sweet songs on a peaceful note. A listen of this album goes by very quickly, but the catchy hooks and melodies linger, leaving a trace of upbeat synths and enthusiastic vocals.